Sometimes we don't give pop quite the attention it deserves at FADED GLAMOUR. Then again, our definition of pop is probably looser than most people's. 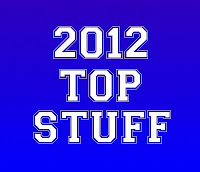 Anyway, here our ten favourite pop tracks of 2012, in a handy YouTube playlist. Gingers, Koreans, Girl Power - we've got it all covered. When she's not going around and slagging off music blogs, Beyonce's little sister is busy wowing music blogs. Co-written by Dev Hynes, whose musical career continues to confound and amaze, 'Losing You' is a surprisingly experimental slice of sparkling pop. It might not have dazzled in the way we initially expected but Paul Epworth and Adele eventually grew to meet the weight of expectations. The latest Bond theme fit in magnificently with the stunning opening titles sequence of 'Skyfall'. Sombre and stirring. 'Something New' was Girls Aloud's first track is three years, and is probably up there as one of their best. Catchy and danceable - combining the classic Girls Aloud sound with the girls own individual solo styles to create Girls Aloud 2.0. Ed Sheeran has typically been a divisive figure in the pop world since he broke through - loved by his legion of fans, spurned by many others as middle-of-the-road dross. We were won over by Ed's performance of 'Drunk' on 'The Graham Norton Show' of all places - his sincerity and strength of songwriting coming through to the extent that the stripped down live version far exceeded its recorded counterpart. It's quite possible to argue that neither Sub Focus or Alpines are pop acts. Regardless, their unexpected and brilliant collaboration proved to be electro-pop magic, with a storming drum and bass undertone. It took us a while to get into Carly Rae Jepsen's dominant anthem but thanks to Steve Kardynal's ChatRoulette version and Cookie Monster's 'Share It Maybe', we soon saw the joy that 'Call Me Maybe' brought to the world. Hopefully it brings a smile to your faces. After 2010's underwhelming debut record 'Lights', we weren't sure that Ellie Goulding was going to do anything to impress us second time round. Our cynicism gave away when 'Anything Should Happen' appeared before being entirely blown away by the incredible 'Figure 8'. We're not quite sure whether it was Swifty convincing us that she’ll never get back with him, or her own attempts to convince herself that she shouldn’t do it. Nonetheless, the situation provided us with one of the best pop songs ever written. It’s possibly 2012’s answer to Girl Power. Until we heard Mt. Wolf's heartfelt cover of 'Climax', we had no idea that this track even existed. Yet we felt the power of Usher's incredible falsetto and Diplo's swirling electro production immediately. Potentially a career peak for the aforementioned duo but we very much hope to see them return and try to top this astoundingly powerful effort. Listen to all the tracks in the playlist at YouTube or in the embed above.